Winter has just set its foot and so has the skin woes! The winter affects our skin in every way however the area that bears most of the brunt is our foot. Dry feet, cracked heels etc. are the most evident symptoms. If proper care is not taken at the right time then it can result in severe pain in the foot and heels too. By proper care, we don’t mean a lavish Spa treatment or a pedicure although these things will help in preventing the condition. We mean there are some awesome foot creams that can come to your rescue and help you to get you out of this situation easily. In this post, we will list out some of the most useful and popular foot creams available in the market that can help you deal the feet issues. There are several types of foot creams available in the market and in today’s post we get you a compilation of the best of them. The Body Shop Hemp Foot Protector: – The Body Shop Hemp Foot Protector is a rich foot cream which contains essential fatty acids that gives the dry skin that extra nourishment required, which a regular moisturizer will not be able to provide. The cream is green in color and has an earthy scent. Since it has a mild scent it is good for sensitive skin too. Ranbaxy Xerina Foot Cream: – Ranbaxy Xerina Foot Cream moisturizes as well as exfoliates rough and dry skin. If used regularly then it will help to heal cracks and corns on the feet, invigorates and revitalizes skin and feet. It also smoothens and softens the skin on the feet, elbow and other parts of skin that are extremely rough and dry. FabIndia Avocado Foot Cream: – The FabIndia Avocado Foot Cream is a foot cream that acts super-fast on the cracks and dry skin and gives smooth and soft feet. The consistency of the cream is light so it does not leave the skin greasy yet is as nourishing as the rest of the creams. Tvam Foot Massage Cream – Sea Buckthorn: – The Tvam Foot Massage Cream is very good in repairing and healing cracked heels. It moisturizes as well as protects the feet and makes it soft. RevAyur Crack Healing Cream: – The RevAyur Crack Healing Cream works towards the regeneration of skin cells and also to renew the skin texture. Other than that it heals, tones as well as moisturizes the skin. This cream helps you to keep the feet hydrated and deodorized. It relieves chapped and dry heels. It is very gentle so can be used daily. It will also keep the feet bacteria free. Himalaya Footcare Cream: – Himalaya Foot Care Cream eliminates the cracked heels and nourishes rough feet. It will also prevent further cracking of heels and in addition it will protect the feet from microbial infections. 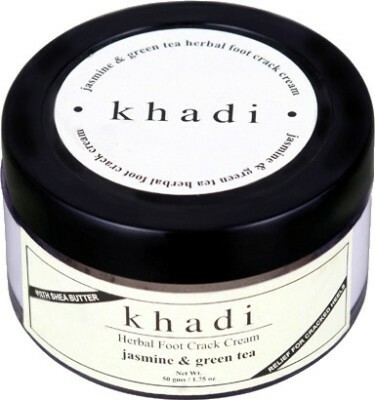 Khadi Herbal Foot Crack Cream – Jasmine & Green Tea: – Khadi Herbal Foot Crack Cream provides fast relief from aching heels. It soothes, moisturizes, conditions and protects the skin too. 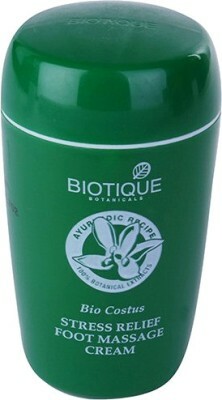 Biotique Costus Foot Massage Cream – Bio Costus: – Biotique Costus Foot Massage Cream – Bio Costus is a nourishing cream that moisturizes as well as soothes the feet. It softens the feet and takes the dryness off the skin. It also revitalizes the heels. 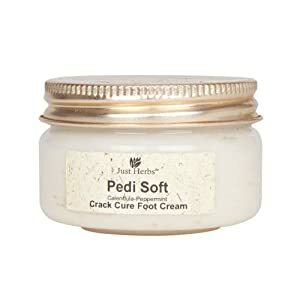 Just Herbs PediSoft Calendula-Peppermint Crack Cure Foot Cream: Just Herbs Pedi Soft Calendula-Peppermint Crack Cure Foot Cream is a cream that is specially formulated to soothe as well as heal the feet. The cream heels away the cracks, makes the feet soft and repairs the cracked heels and nourishes the rough and chapped skin.